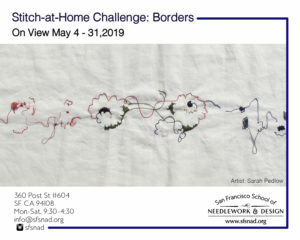 These needlework pieces explore the idea of ‘borders.’ Borders are both metaphorical and literal, fixed and fluid. Internal boundaries delineate our moods and protect us from threat; external borders serve to define lands, politics, cultures and linguistic variations. They can take the form of whitework edging on a handkerchief, change in thread color from one square of cross-stitch to the next, integrate meeting points, the corners of an embroidered vertical and horizontal border, or the blending of languages, customs, and cuisines in border towns. Hanging Thread is a rotating exhibition space at San Francisco School of Needlework & Design. Admission is free. Selected works will travel to the San Jose Museum of Quilt & Textiles from July 31 – October 13, 2019.